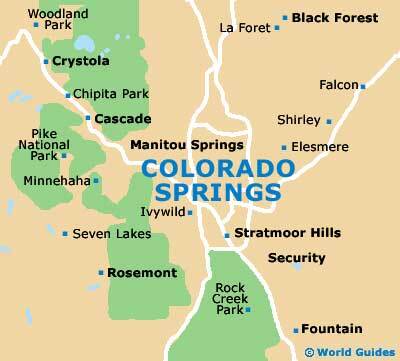 Colorado Springs is an expanding city and is now the second-largest city in the state of Colorado, lying within the Rocky Mountains area. 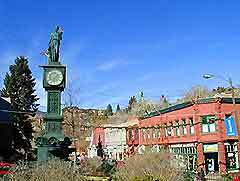 Situated below Pikes Peak and close to Manitou Springs, Colorado Springs is a conservative city, with the charm of a typical small Western town. With some spectacular scenery, including the Garden of the Gods, the city's tourism industry is most busy during the summer months, although winter is also an excellent time to visit the area, when hotel rates are reduced. 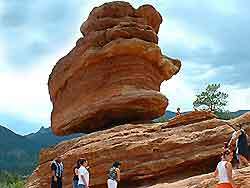 Colorado Springs sits just 70 miles / 112 km south of Denver and was originally developed as a tourism spot in the late 19th century, and now features some of Colorado's best restaurants and accommodation. Reliable resources for tourist information in the city include the Colorado Springs Visitors Center on Cascade Avenue, which is open throughout the year, although closed at weekends during the low season. There is also a useful office for the USFS Pikes Peak Ranger District located on South Weber Street, close to the South Shooks Run Park, where you can find out about possible recreational activities close by. Hotels in Colorado Springs suit most budgets, being situated within the city center and spreading out to many of the surrounding suburban districts, such as the Manitou Springs area and the Old Colorado City District. A wide range of budget accommodation options can be found along Nevada Avenue, in the South Circle area and on Aeroplaza Drive. More information about Colorado Springs Hotels. Colorado Springs has many world-class tourist attractions, including the Garden of the Gods - the area's premier sight to see, consisting of unique red sandstone formations and hiking trails; the Cheyenne Mountain Zoo - the country's only mountain zoo, housing over 500 animals, with a background of breathtaking mountainous scenery; the Air Force Academy - one of the most visited attractions in Colorado Springs, including the Cadet Field House, Cadet Chapel and a planetarium; the Cave of the Winds - a series of caves and fascinating underground caverns; the Ghost Town - with information about the historic Wild West, including authentic buildings brought in from all over the state; and the Pikes Peak Cog Railway - the world's highest cog railway, traveling to the very summit of Pikes Peak. Other prominent sights in Colorado Springs include Glen Eyrie Castle - the 19th-century home of General William Jackson Palmer, founder of Colorado Springs; McAllister House - one of the city's oldest houses, now on the National Register of Historic Places; Broadmoor - an Italian Renaissance-style building and the most famous resort in Colorado Springs; Miramont Castle - one of the area's most unique buildings, consisting of a range of architectural styles, housing a miniatures museum; the Memorial Park - boasting a range of sporting facilities, including an ice center and tennis courts; and Palmer Park - donated to the city in 1899, with walking trails, picnic spots and baseball fields. 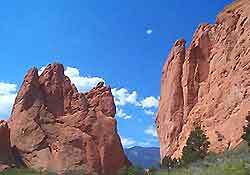 More information about Colorado Springs Tourist Attractions and Colorado Springs Landmarks. Tourist attractions located close to Colorado Springs include the Buckskin Joe Frontier Town and Railway - offering an authentic Wild West experience; the Royal Gorge Bridge and Park - a popular park and entertainment venue with the world's highest suspension bridge; the Royal Gorge Route Railroad - a two-hour train trip along the banks of the Arkansas River; Cripple Creek - a historic mining town close to Colorado Springs, where gold fever struck in the 1890s; and Seven Falls - a series of seven distinct cascading falls, listed on National Geographic's list of international waterfalls. Colorado Springs features some superb museums, with favourites including the American Numismatic Association Money Museum - housing an important collection of rare coins and paper money from around the world; the Manitou Cliff Dwellings Preserve and Museums - at the base of Pikes Peak, built more than 700 years ago and moved to this location in the early 1900s; the ProRodeo Hall of Fame and American Cowboy Museum - full of memorabilia and exhibits, with historic information about the development of rodeo; the May Natural History Museum of the Tropics - home to one of the world's largest collections of tropical insects and invertebrates; the Western Museum of Mining and Industry - with a host of information and exhibits, documenting the area's rich gold mining past; and the Colorado Springs Fine Arts Center - containing an extensive collection of Native American and Hispanic art. More information about Colorado Springs Museums and Colorado Springs Art Galleries.